Here is a ton of ways to letter A with a free hand lettering practice set. Learn new modern calligraphy and brush lettering styles to keep practice fun! 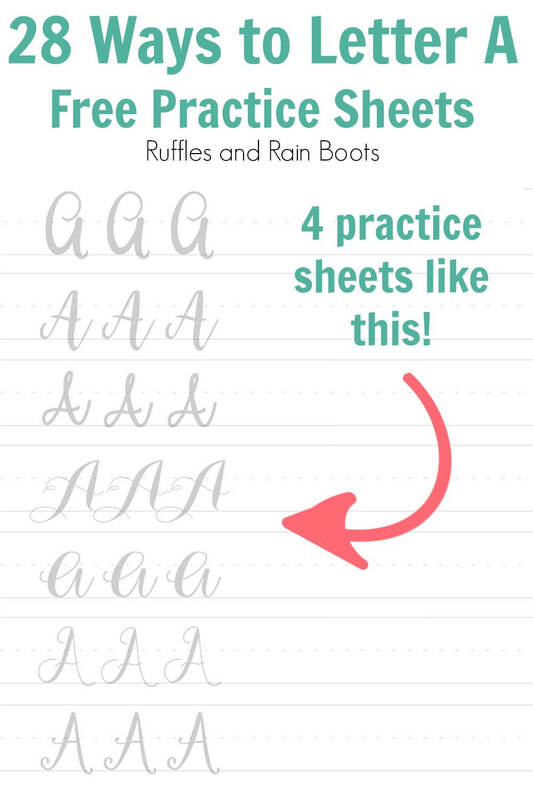 If you’re new to Ruffles and Rain Boots, I love to share free hand lettering practice sheets. 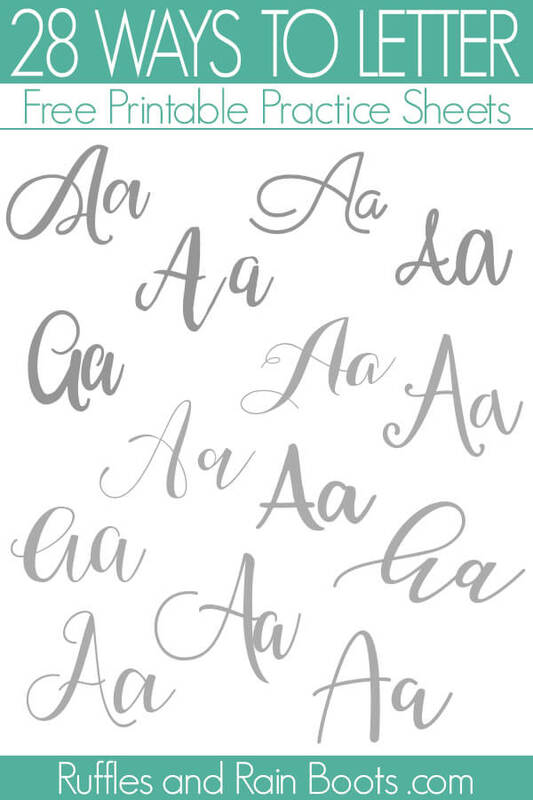 You can find all of our lettering sheets here in the Lettering Library (subscribers only). From fun sets like unicorns and mermaids, to complete alphabets in tons of styles, I share a lot. Why do I share so much free lettering practice? Because getting better at lettering is all about practice. Sure, I love it when someone finds their own style but being able to add new ones is important, too. It challenges you, makes you try out new supplies, and most importantly, it keeps it interesting. 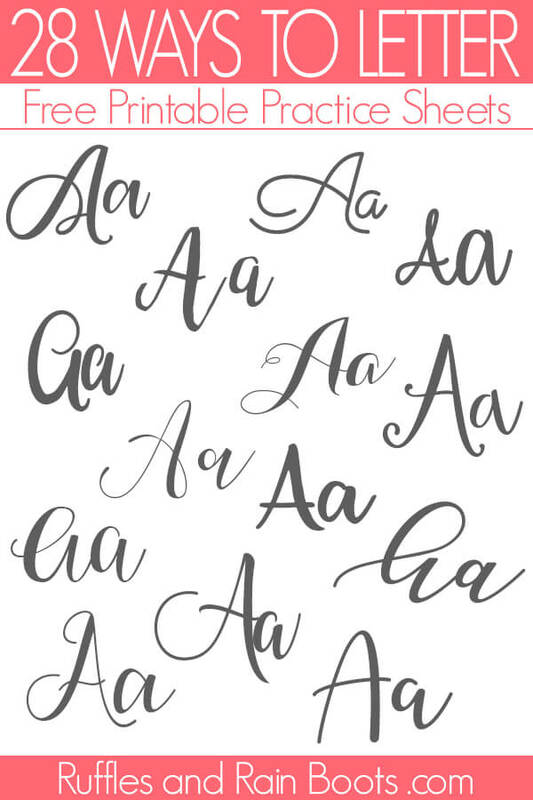 This set of “Ways to Letter A” comes with both small and large pen practice! No Time to Practice Now? Save This for Later! I know how it is – you’re on your phone and have no time to practice. It’s okay, just pin this to your favorite hand lettering practice board on Pinterest and come back to print it out. I’m going to be sharing the entire alphabet this way, and I have tons of tips to share. After you’ve practiced, use the letter prompt to start a word. Build what you think would be a good match for the rest of the letters. For example, for an uppdercase letter A, letter Alexis (or another capitalized word). For the lowercase letter a, letter apple. This will help you hone your personal lettering style. If you are already getting the Ruffles and Rain Boots newsletter, you have the password you need at the bottom of every email I send. Just go to the Lettering Library, type it in, and hit up the “Ways to Letter” section.